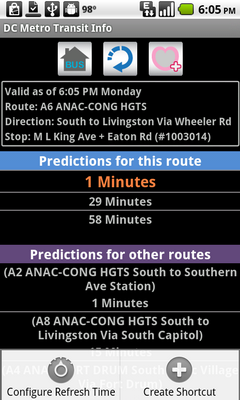 New Circulator route Dupont-Rosslyn added. 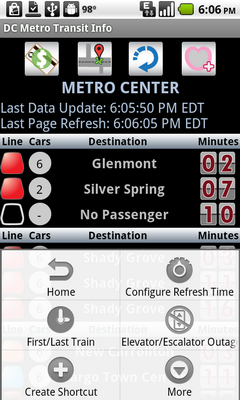 The Metro Bus data format changed. Updated to support the changes. The first version of the trip planner is out and includes Metro station to Metro station via Rail only. We also released a couple of updates over the last few days to address various compatibility issues with the newer phones and to improve battery life. As always, email us with suggestions, comments, or errors! The Android OS decides where to place the shortcut on the home screen so it may not always show on your primary screen. You can move the icon just like any other by long-clicking it and dragging to the edge of the screens. Each type of refresh (train & bus) can be configured differently. We also added the current scheduled First and Last train times for each station. You can also find this on the station's status screen menu.